St Marks was one of the first Episcopal churches to be built in the Edinburgh Diocese after the repressions of the Penal Laws that followed the Jacobite risings in the 18th century. It is surrounded by a graveyard, which is still used for burials and the interment of ashes today (history of the graveyard). 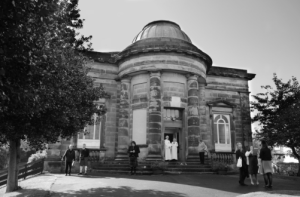 The building has a category B listing and is of a villa like Neo Classical design, fronted with an imposing semi-circular Doric arched porch with flat topped dome which conceals a cupola lantern that lights the inner vestibule and stair to the gallery. The original so called “chapel” was erected by Colonel and Mrs Robert Haliburton and Mr and Mrs James Rutherford at their own expense and constructed with remarkable speed by builder Robert Gray. The ground having been feued from the Marquis of Abercorn in 1825, it was opened on 19 May 1826 and consecrated on 21 August 1828 by Bishop Sandford. The church was square in plan and ‘designed for the performance of Divine Worship in the Episcopalian form’. It comprised the present nave with balconies on three sides. In 1892 the church was altered by Hay & Henderson. The two side galleries were removed, the ceiling reinforced and the chancel added to the south. The two windows to the north facade were also changed from sash and case windows to the Venetian style one that can be seen today. 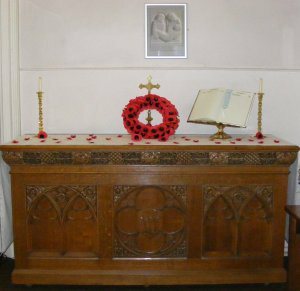 In 1919 a Lady Chapel was created on the west side of the church in memory of the 48 members of the congregation who fell in the Great War. It comprised an altar with a white marble slab on two black pillars. Over it was a tabernacle for the Reserved Sacrament, surmounted by a niche in which stood a crucifix. Behind it was a simple reredos of oak. The chapel was surrounded by an oak screen with eleven arches containing semi-circular panels carved by members of the congregation, one of which can be seen on the Crypt Chapel door. The Lady Chapel was removed following a serious fire in 1967 which started in the boiler room and burned its way through the floor at the rear of the church, the heat reportedly melting the candles on the altar. Other changes were also made at this time. In the chancel the altar was brought forward from the brown marble reredos (both 1872), the floor levelled and the altar rails relocated. The pulpit was also removed and replaced by two lecterns. 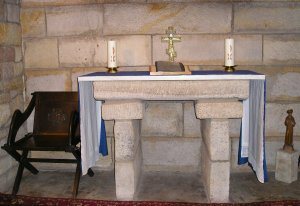 In the basement a vestry and small stone-lined chapel were built, all largely the work of Alex and Ian Miller, members of the congregation. The Crypt chapel is used during the winter months for the Thursday morning eucharist. In 1990 a meeting room, kitchen and accessible toilet were constructed under the gallery and a second meeting room (The Tom Muirhead Room) formed in the basement. The architects being Campbell & Arnott. The two pictorial stained glass windows to the East and West of the nave (1882) are by Ballantine & Sons and have their characteristic Renaissance borders. They depict the Good Samaritan and ‘The soul of Jonathan knit with the soul of David’. The stained glass over the altar was gifted in 1919 and depicts Christ crucified, flanked by Mary, the mother of Jesus, and St John. It replaces an earlier stained glass window gifted in 1872 that was transferred to the back of the nave to make way for the new donation. It is believed that this earlier window was destroyed in the fire of 1967. The organ, built in 1828 by David Hamilton of Edinburgh, was relocated from the rear gallery to the then new chancel in 1899 by Ingram of Edinburgh. The water powered mechanisim was replaced by an electric motor in 1972 by Ronald Smith. The organ required complete overhaul in 2007, and instead was replaced by a Wyvern digital organ. The sacristy lamp was gifted to the church in memory of F/SGT Hamish Ian Sandison who was killed together with nine other members of his crew in an air accident in 1946. His war grave is located in the churchyard. 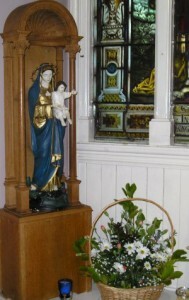 The side altar (1903) is from St Andrews Church, Niddrie. On the west wall is a plaque dedicated to the 65 members of the congregation who gave their lives in the two World Wars. Essential repairs to the external fabric of St Marks were completed in 2006. In particular the church’s landmark dome was restored to its original glory after five decades covered in asphalt. 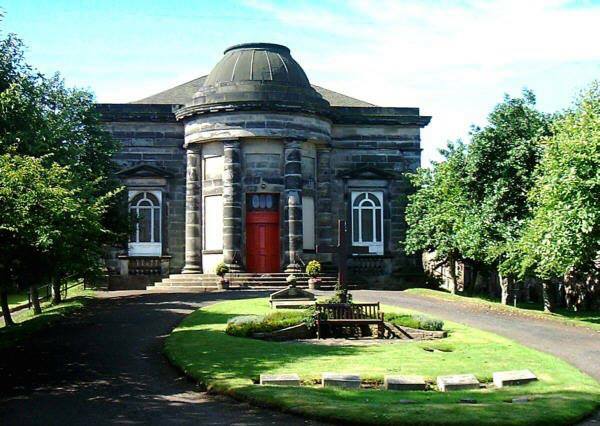 The project was generously supported by the Heritage Lottery Fund, Historic Scotland, Allchurches Trust Ltd, Artemis Investment Management, City of Edinburgh Council, Diocese of Edinburgh and Scottish Churches Architectural Heritage Trust. If you would like to visit St Mark’s, please come to any of our services. The church is also always open to the public in the mornings on the first Saturday of every month, 10:00-12:00.